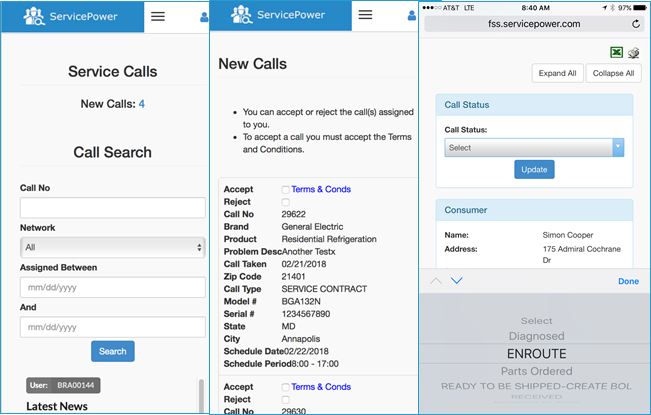 ServicePower, a market leader in field service management solutions, is pleased to announce a series of product updates intended to build on the Q4, 2017 Customer Experience product release. This set of enhancements provides additional functionality for Mobility, Scheduling, and Contractor and Warranty Claims Management, as well as the Consumer Portal. The updates will help improve the experience delivered to customers in the field by improving parts scheduling, tech navigation, priority contractor dispatching and customer engagement. Scheduling has been enhanced with new parts scheduling functionality. Field service organizations can now dynamically update stock levels across its mobile workforce, and automatically schedule multiple parts from vehicle stock for individual jobs. Using its patented artificial intelligence engine, Scheduling can also now calculate future spares, ensuring technicians have necessary parts to complete future jobs. Customers benefit from field teams better prepared with parts, asset and contract information. Automated flows of available stock, parts scheduling requirements and parts utilization improve operational efficiencies. The Mobility solution enhances service delivery with additional new part related features including automated inventory adjustments and utilization, further improving a technician’s ability to effortlessly deliver a great customer experience with the required parts. New payment gateway integration improves onsite payment processing. Enhanced technician messaging provides instant notice of schedule changes. And, mixed reality functionality provides technicians with hands-on access to expert repair assistance while onsite. The improved functionality further enables field teams to drive first time fix rates and improve visibility for customers. The Consumer Portal has been improved with new theme capabilities, enabling clients to extend their own brands via ServicePower’s portal, including customized messages and statuses, color themes, logo, fonts and languages. The Contractor and Claims Management Solutions benefit most in this latest release. Trusted by more than ninety percent of consumer product OEMs, service contract administrators and retailers in the US and UK to on board, credential, manage, dispatch and reimburse their contractor networks, new enhancements make it easier for our clients and their service networks to improve their customers’ experience. New priority based dispatching logic yields the ability to dictate the order in which dispatching rules are applied. When used in conjunction with ranking logic, clients can dispatch the best service provider for unique job. In addition to our Mobility solution which can be deployed by our clients to employed or contracted workforces, we’ve now also fully mobilized our dispatch portal through responsive design, enabling service providers to seamlessly receive, accept and update job status, from the application on any device. As the field service industry continues its focus on improving the customer experience to drive additional revenues, real time status updates are critical. ServicePower also now supports dynamic dispatch of jobs using status update metrics in the logic. This latest announcement bolsters the company’s reputation for digital innovation adding to its advancements in artificial intelligence, customer engagement and enterprise mobility.